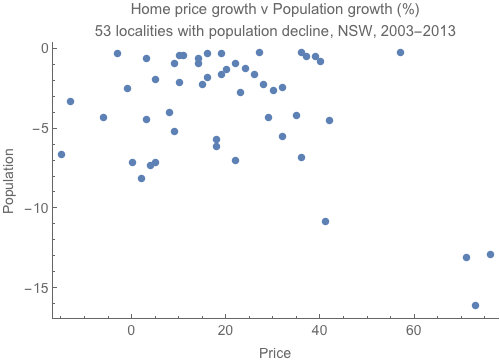 Lindsay David compiled data on Australian home prices recently and found that 52 localities in New South Wales had negative population growth over the decade from 2003-2013. But these places had just as much of a housing price boom as anywhere else, putting to rest once and for all the various arguments that regulatory supply constraints are a key element affecting Australian home prices. It could be just me, but a town with a 15% population decline really can't be argued to face any sort of housing shortage, indeed arguably this housing glut was insufficient to counteract a 70% price increase over the decade. Perhaps the answer is that the static demand-supply equilibrium model is an inappropriate tool to analyse the economics of housing.